Granada is one of Spain’s most precious gems. The classic flamenco guitarist Andres Segovia described the city as a “place of dreams, where the Lord put the seed of music in my soul.” Occupied by the Moors for several centuries, Granada boasts a rich historical legacy, not least the Alhambra palace-fortress, which dominates the skyline from its hilltop perch. Indeed, the city’s setting, with the often snow-clad Sierra Nevada as a backdrop, is simply magnificent, as is the benign climate and stunning architecture. Not to mention a vibrant student population, a buzzing cultural life and enough nightlife options to fill several lifetimes. Granada existed before the Romans conquered Spain – then referred to as Iberia – as a small settlement, called Iliberis. It subsequently fell into Roman hands after they took control of Spain from the Carthaginians during the Second Punic War; known as Illiberia Florentia, the town became an important trading outpost in Andalusia under Roman rule. After the collapse of the Western Roman Empire, Spain was conquered by the Germanic Visigoth tribes, who took control of most of the Iberian Peninsula in the 6th century AD. However, their reign was relatively short-lived and in AD 711 Muslim forces took over from the Visigoths, quickly establishing a stronghold across Andalusia and beyond. The Moors controlled Andalusia for several centuries; their rule reached its apogee after Abd ar-Rahman III named himself caliph and severed his Spanish Kingdom from the control of the caliphate in the Middle East. However, the caliph’s reign ended when the general Al-Mansur staged an uprising and took control of significant territory within Andalusia during the latter part of the 10th century. Eventually, the caliphate collapsed and Al-Andalus became a splinter state of several tarifas, or small kingdoms. In the 11th century, Granada was ruled by the Zirid dynasty, who controlled the tarifa from their base in the city’s Albayzin quarter. Their rule collapsed in the 13th century when the Almohad state ruling Al-Andalus descended into anarchy and the region’s capital, Cordoba, was captured by the Spanish King Fernando III in 1236. However, Granada remained a Muslim stronghold for over a century after Cordoba fell, when a minor potentate called Mohammed ibn Yusuf ibn Nasr created an independent emirate, known as the Nasrid emirate, centered on Granada. It soon became both a center of refuge for Muslims fleeing Christian persecution and the final remnant of Al-Andalus. During this period Mohammed began to develop the Alhambra as his royal court, palace and fortress, which played host to the Nasrid dynasty for over 200 years. Under the Nasrids, Granada became one of the wealthiest and most prosperous cities in Europe, and Muslims flocked to the city, safe in the knowledge that they would be free from religious persecution. Sadly, this prosperity was not to last and by the 15th-century political infighting and a stagnant economy laid the foundations for a civil war. In 1482, Christian armies invaded the Granada emirate and captured its ruler Abu Abdallah Muhammad XII, known as Boabdil, who agreed to surrender much of his territory in return for retaining control of Granada. Boabdil kept control until 1492 when Fernando and Isabel finally marched triumphantly into the city after an 8-month siege. 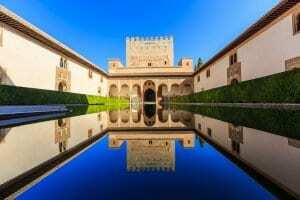 They set up court in the Alhambra for several years, following Muhammad’s banishment. Despite promises to the contrary, Fernando and Isabel had no intention of protecting Spain’s remaining Muslim population and religious persecution soon soured the scene. Jews were also expelled and in the early 17th century, the fanatical Spanish King Felipe II signed a decree ordering the expulsion of all Moriscos (converted Muslims) from Spain. It was a dark time for Granada and indeed Spain as a whole. The once prosperous city of Granada began down a path of major decline in the 17th century, as the city lost much of talented populace and subsequently its wealth and importance. In fact, Andalusia in its entirety suffered greatly during this era – famine and disease killed some 300,000 people and many more were forced to emigrate. In the 18th century, Granada entered a period of brief recovery, spurred on by the changes implemented by the Bourbon dynasty during the Age of Enlightenment. New industries were founded and Granada’s population grew, albeit slowly, as people returned to Andalusia. Unfortunately, the 19th century saw a complete reversal of the gains made during the Age of Enlightenment. Granada and the surrounding regions became destitute; with a lack of any real industry, Andalusia was renowned as one of Europe’s most backward and social deprived regions. Hunger, disease and widespread poverty were common, save for the wealthy landowners who continued to thrive. Granada played an important role in the 20th century during The Spanish Civil War between the military dictator Franco and the Republican government. The city was notoriously conservative and frowned upon the Republic’s liberalism, leading to the horrors unleashed once the Nationalists took the city at the start of the conflict in 1936. Over 4,000 citizens with left-wing or liberal associations were murdered, including Federico Garcia Lorca, Granada’s most famous writer. Ultimately, Franco’s Nationalist army won the conflict and retained control of Spain until his death in 1975. Today, Granada remains one of Spain’s most enthralling cities, imbued with both a remarkable historical legacy and a wonderful joie-de-vivre, which is most apparent in the city’s atmospheric medieval quarter at night. For Granada manages to be all things to all men – an outdoor museum and testament to Spain’s complex past, a student party town and a spectacularly situated destination, where visitors can discover Andalusia’s culture and cuisine in all its raw authenticity. In both past and present, Granada is truly glorious. One of the joys of eating out in Spain is the sheer sociability of the Spanish, and here Granada is no exception. Tapas bars and restaurants buzz with families and friends dining into the early hours, enjoying the varied delights of Andalusian food & drink. Modern Andalusian cuisine reflects the diverse culinary influences exerted across the region over the centuries, with a particular emphasis on Arabic flavors and ingredients. Granada’s kitchens tend to blend seafood and tropical fruits from the nearby coast, with meat dishes from the interior and fresh vegetables from the market gardens of La Vega. The city’s Muslim past is evident in the rich assortment of pastries such as syrup cakes and almond meringues. 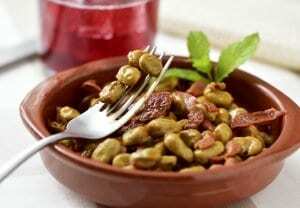 Habas con jamon (broad beans with ham) is a very popular local dish, as is Tortilla Sacromonte, an omelet combining cured ham, prawns or oysters, green beans and offal. Nicer than it sounds. Tapas are, of course, another major highlight. They come in many, many guises and Granada, unlike most Spanish cities, will serve free tapas, depending on the number of drinks you order! Bodegas Castaneda is one of our favorites, serving a range of classy tapas in a typical Spanish wine bar setting. Alternatively, for a taste of Lebanese cuisine, you won’t go far wrong with Samarcanda on Calle Caldereria Vieja, which offers an assortment of delicious dishes – Hummus and falafel are among the tantalizing delights on offer. But, for a romantic evening, you must try Terraza las Tomasas in the Albayzin. It’s a little hard to find, but the restaurant is blessed with the best views of the Alhambra, with excellent food and service to boot. You will find it on Caril de San Agustin. Andalusia’s greatest contribution to the world of wine is Jerez or Sherry to English speakers. Produced in the towns of Jerez de la Frontera, El Puerto de Santa Maria and Sanlucar de Barrameda, Jerez is a stupendous fortified wine, aged in oak casks, sometimes for decades. It comes in three main styles: Fino, Amontillado an Oloroso. Fino is bone dry and straw colored, an excellent aperitif and match for tapas dishes. An Olosoro has been aged for far longer, with a correspondingly darker color and richer flavor, while Amontillado is an amber, moderately dry aged fino with a strong nutty flavor. In addition, most restaurants in Granada will serve a variety of wines from different Spanish regions, although don’t expect too many choices from further afield. Granada’s most famous monument to the past glories of Moorish rule, the Alhambra is the stuff of fairytales. Magical use of space, light, water, and decoration characterize this most sensual piece of architecture. It was built under Ismail I, Yusuf I and Muhammad V, caliphs who ruled the Nasrid dynasty for over 200 years. They sought to create their idea of paradise on earth, a dream which many would argue was fully realized. Major highlights include the Patio de Arrayanes and the Generalife, on the Alhambra’s northern side. Here, you will be amazed at the splendor of the country estate of the Nasrid kings. The idyllic gardens, begun in the 13th century, have been modified over the years and today host Granada’s annual music and dance festival. We can think of no better setting. There is no finer way to appreciate Granada’s majestic beauty, than from the top of the Albaycin on a warm evening. It is here that one feels closest to the city’s Moorish ancestry – a fortress was first built here in the 13th century and there were once over 30 mosques. Along its winding cobbled alleys stand carmenes, villas with Moorish decoration and gardens, secluded from the world with their high walls. An unmissable experience is to take a stroll up to the Mirador de San Nicolas. The view over the maze of roof-tops of the Alhambra glowing in the sunset is spellbinding. Built on the strict orders of the Catholic Monarchs, work on Granada’s beautiful cathedral began in 1523, designed in a Gothic style by Enrique de Egas. It continued under the Renaissance master Diego de Sileo, who also designed its facade and magnificent, circular Capilla Mayor. Today, its splendor is most apparent in the dome windows, which depict Juan de Campo’s The Passion. Occupying the Casa de Castril, a Renaissance mansion with a plateresque portal, this is one of the region’s finest museums. 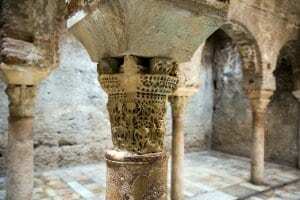 It displays a wealth of Iberian, Phoenician and Romans antiquities from the Granada province and is not to be missed.